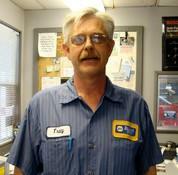 Tracy – As the first person you’ll see when arriving to the shop – Tracy is the Service Writer and General Manager. In addition to scheduling the repairs and maintenance for our customers, he orders parts, maintains inventory and keeps our customers satisfied. Originally from California, he moved to Arizona and has lived in the neighborhood together with his wife. He spends his time away riding his off-road motorcycle.